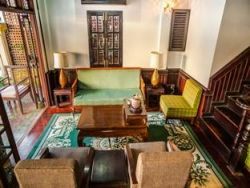 Conveniently located near the beautiful Vat Sensoukharm temple, The Chang Inn Luang Prabang is surrounded by various historic attractions, all of which can be reached by a short walk. To name but a few are the lofty Xieng Muan Heritage House, the exquisite temple Hor Pra Bang, and the National Museum of Luang Prabang. Inviting all guests to experience the feel-at-home concept, all eight rooms feature excellent facilities and elegant Laotian décor. The Chang Inn Luang Prabang also offers superior services, especially the locally famous Chang Inn Restaurant, which serves a fine American breakfast and traditional Thai cuisine for lunch and dinner in a relaxed atmosphere. To indulge in the local life of Laotian people, guests can participate in Buddhist merit making of giving Buddhist monks some alms arranged every morning by the hotel on the Sakkarine Road.